Masala dosa is a popular south Indian food. It is made from fermented batter of rice and dhuli urad dal(split black gram skinless). Dosa has high protein and carbohydrates. Masala or stuffing is made from boiled potatoes and onions. 1. Heat oil in a pan. Add rai, curry leaves, heeng. When rai starts to splutter add onions. Cook onions for 2-3 minutes so that onions become light brown. 2. Add mashed potatoes. Add salt, haldi powder, green chilli and mix well. Cook for 3-4 minutes on medium heat. 3.Wash both rice and soak them in water for 3-4 hours. Wash dal and soak it in another vessel for 3-4 hours.Also add fenugreek or methi seeds to dal. 4. Drain water and grind both rice in a blender till soft. 5. Drain water and grind urad dal and methi seeds .Add some water and grind . Grind till batter becomes soft and fluffy. 6. Now mix both rice and dal batter by adding more water.Mix with hands. Batter should not be very thick nor very thin. 7. Now transfer this batter in large vessel and place it overnite to ferment. Add salt to the mixture. 8. For making dosa heat a nonstick tawa . Grease it with oil ,add ladle full of batter in circular way. 9. Pour some oil around dosa and cook till it gets golden brown colour. 10. Place 2-3 tbsp of potato bhaji in centre and fold both sides. 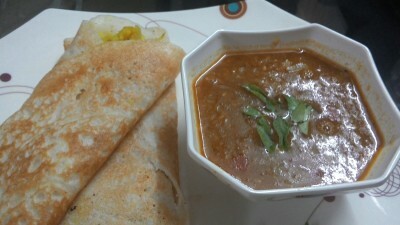 This entry was posted in Anupama Magic, South Indian recipe and tagged potato, rice. Bookmark the permalink.